This uncommon name, found chiefly in the counties of Gloucestershire and Wiltshire, is of Anglo-Saxon origin, and has two possible sources. Firstly, it may be a locational surname from some minor, unrecorded, or now "lost" place, believed to have been situated near Chippenham in Wiltshire; the place is believed to have been named with the Olde nglish pre 7th Century elements "haegthorn", hawthorn, and "hyll", hill. An estimated seven to ten thousand villages and hamlets are known to have disappeared since the 13th Century in England, due to such natural causes as the Black Death of 1348, in which an eighth of the population perished, and to the effects of the many Enclosure Acts since the 15th Century. 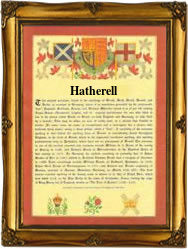 The second possible source of the surname, found as Hatherell, Hatherill, Hatherall, Haddrell and Had(d)rill, is also locational, as a variant form of Hatherley, from the place(s) so called in Gloucestershire, now "Down" and "Up" Hatherley. The component elements of the placename are the Olde English "haegthorn", as before, and "leah", wood, glade, clearing. Examples of the surname from Church Registers include: the marriage of Bartholome Hatherell and Suzanna Tyllie, in Calne, Wiltshire, on October 10th 1583, and the christening of Gyles, son of Thomas Hatherell, on October 25th 1618, at Chedworth in Gloucestershire. The first recorded spelling of the family name is shown to be that of Ambrose Hathrell, which was dated November 28th 1576, witness to the christening of his son, John, in Ozleworth, Gloucestershire, during the reign of Queen Elizabeth 1, known as "Good Queen Bess", 1558 - 1603. Surnames became necessary when governments introduced personal taxation. In England this was known as Poll Tax. Throughout the centuries, surnames in every country have continued to "develop" often leading to astonishing variants of the original spelling.